What a story. I knew some of the bare bones: Houdini’s deep attachment to his mother, and the failed attempts to hear from her after her death; Sir Arthur Conan Doyle’s extraordinary credulity for mediums and fairies. I did not know about the magazine Scientific American‘s contest attempting to find a medium with verifiable ability, or about Margery the Medium’s quest to win it. How disappointed Houdini would be that, ninety years later, we as a culture are still every bit as credulous as Doyle was we were then. I was shocked when a coworker began telling excited stories about the medium she saw to get in touch with her son who died at ten years old. Correction: the medium she paid a fair amount of money to see. I did some rough calculations based on this young man’s schedule, and figured he must be pulling in five digits a month, all for a chance – just the chance, mind you, and a vanishingly small chance in the larger venues – to have him talk to your loved ones in the great beyond. At $35-$60 a head, depending on whether dinner is included with the show. Me, I’m with Hamlet, Horatio – dreamt of in your philosophy, and all that. I try to keep an open mind. But I listened to the story of this woman’s experience – experienceS, as she went several times and sent family members – and then listened as each story was told again, and then again, and … they changed. One anecdote made the hair stand up on my arms the first time I heard it. Thinking about it more rationally, away from the eager longing belief of my coworker, I recognized all the ways a con man could have produced it. I’ve seen James Randi; I’ve seen The Mentalist. Then when the story changed in a retelling – where the medium originally spoke of “flowers”, now it was remembered as the much more specific “roses” – my heart sank. This is how belief is perpetuated. Now, if people can afford to go and are comforted, then perhaps the money is well spent, and far be it from me to play Houdini and try to bust the conman (even if I could). I could never bring myself to pop that fragile bubble of hope, or whatever it is. But if the young medium – he’s not yet thirty – is what I can’t but think, a complete and total fraud fleecing grieving people out of horrifying amounts of money… there’s a very special place in hell. Mina (pronounced MY-na, I discovered online) Crandon, who went under the name Margery the Medium to (ineffectually) protect her identity in the media, was a society woman (though not originally) who, almost abruptly, began channeling a spirit medium, first for friends, and later for publicity. (Which is of course interesting in light of that whole using-another-name-to-protect-identity thing.) And then when Scientific American threw open a contest offering a cash prize for the first medium to be authenticated by a panel of scientists, she put herself forward. Repeatedly. Before long it became something of a personal feud between Mina and Houdini, he going above and beyond to debunk her and she going to actually alarming lengths to foil him. It’s all very outré – some of the methods used by Mina and other spiritualists raised my eyebrows, or made me queasy (or both). The lengths people went to in order to fleece people are almost unthinkable. I wish there were more people – now even more than then – willing to go to slightly mad lengths in order to stop them. 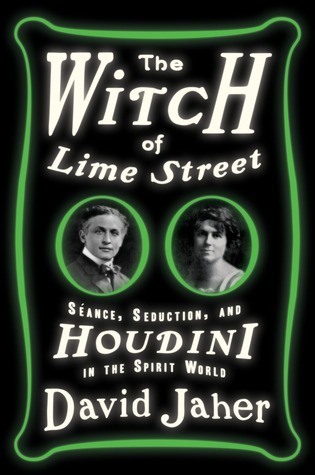 This entry was posted in books, history, non-fiction and tagged David Jaher, history, Houdini, Margery the Medium, NetGalley, non-fiction, The Witch of Lime Street. Bookmark the permalink.